Leaders in Pediatric Heart Care, Discovery, and Education Providing compassionate patient- and family-centered care to children throughout Michigan, around the nation, and across the globe, the Congenital Heart Center at the University of Michigan C.S. Mott Childrenâ&#x20AC;&#x2122;s Hospital is an international referral center for complex congenital heart disease, and is one of the largest and most experienced congenital heart programs in the United States. From diagnosis and management of common cardiac disorders to application of the most innovative and cutting-edge therapies available for children with complex conditions, our specialists are committed to providing the most advanced, evidence-based care for infants, children and adolescents with all forms of congenital and acquired heart disease, as well as for adults with congenital heart disease. Our unique multi-disciplinary research program â&#x20AC;&#x201D; the Michigan Congenital Heart Outcomes Research and Discovery (M-CHORD) Program â&#x20AC;&#x201D; brings together specialized staff and faculty from across the Congenital Heart Center, and the unique resources and expertise at the University of Michigan, to support innovative research and drive improvements in quality of care and outcomes for children with heart disease. Through our extensive training programs in pediatric cardiology and congenital heart surgery, along with many educational offerings throughout the year for patients & families and practitioners alike, we are committed to providing cutting-edge education and information regarding the latest advances in congenital heart care, and to prepare the next generation to serve as leaders in the field. National Advisory Board Our National Advisory Board is comprised of leaders from multiple disciplines including medicine, education, finance, information technology and other fields, along with families who have been impacted by congenital and acquired pediatric heart disease. The Board provides guidance critical to achieving our mission and supporting our relentless commitment to excellence. Lifelong Longitudinal Care and Outcomes With the dramatic improvements in early survival for patients with congenital heart disease over recent decades, it has become increasingly important to shift our focus to optimizing long-term care and outcomes. We have pioneered efforts in this area through our unique, comprehensive Longitudinal Outcomes Program, which encompasses both clinical care and research/quality improvement activities. Our goal is not only to help children with these conditions simply survive into adulthood, but also to determine the optimal treatments to allow them to thrive and enjoy an excellent long-term quality of life. For more information on our research and quality improvement activities, see page 20. Transparency and Collaboration to Improve the Quality of Pediatric Cardiac Care The Congenital Heart Center is committed to transparency, collaboration, and sharing of data to improve the quality of pediatric cardiac care for our patients and children with congenital heart disease around the country. have included statewide efforts to organize and implement pulse oximetry screening in Michigan, an initiative (Project ADAM) that provides schools across the state with guidance and support on how to minimize the risk of sudden cardiac death, and national initiatives such as the Congenital Heart Legislative Conference, advocating for federal funding to support CHD research. Research Our investigators participate in and lead national initiatives geared toward better understanding and measuring quality of pediatric cardiac care. These include projects focused on developing composite measures of quality incorporating aspects of both morbidity and mortality after congenital heart surgery, optimizing measures of ICU quality of care, and refining risk models in pediatric heart transplant. Collaborative Quality Improvement The Congenital Heart Center is a leader and collaborative participant in multiple initiatives aiming to promote sharing of data across hospitals, and identification and dissemination of best practices to improve outcomes and quality of care. These have included projects to reduce the duration of post-operative mechanical ventilation, and optimize interstage outcomes in single ventricle patients, among many other initiatives. U-M leads the Pediatric Cardiac Critical Care Consortium (PC4), which now includes 30 participating centers, and supports collaborative and transparent exchange of information toward improving outcomes across all centers. For more information on PC4, please see page 20. Pediatric Cardiac Surgery Over the past two decades alone, our pediatric cardiac surgery program has cared for nearly 25,000 patients, making us one of the largest, most experienced programs worldwide. The pediatric cardiac surgeons at C.S. Mott Children’s Hospital have earned international renown for their expertise in treating the most complex congenital heart defects. Our program is an international referral center for conditions such as hypoplastic left heart syndrome and other single ventricle lesions, high-risk biventricular repairs, complex forms of transposition of the great arteries and many other congenital abnormalities. Extensive Experience Treating the Most Complex Cases As we have continued to grow as an international destination for complex congenital heart disorders, our patient population has taken on an increasingly high-risk profile. Of the 61 programs reporting their 2012–2015 outcomes on the Society of Thoracic Surgeons (STS) Public Reporting Website, we were one of two US centers performing the highest number of STAT category 5 (highest complexity category) cases during this time period. Excellent Outcomes We have achieved excellent outcomes, performing better than what would be expected for our complex case-mix, and receiving a 3-star rating — the highest designation awarded by the STS — in three of the past five biannual reporting periods. Research and Quality Improvement We lead and participate in numerous projects aiming to advance care and outcomes for patients undergoing pediatric and congenital heart surgery. Please see page 20 for a description of our research initiatives. Our pediatric cardiac surgery program is considered one of the highest-volume programs in the nation by the STS. We are one of two programs in the nation performing the highest number of STAT Category 5 cases. 2015 TOTAL CARDIAC SURGERY VOLUME Our annual surgical volume significantly exceeds the 250 cases/year benchmark that the STS uses to identify high-volume programs. U-M’s pediatric cardiac surgery mortality rates are lower than national benchmarks particularly for the most complex cases. U-M’s post-operative length of stay (LOS) is substantially shorter compared to national averages. U-M median post-operative length of stay (2012–2015), as compared with STS national data. 2012–2015 data. STAT = Society of Thoracic Surgeons-European Association for Cardiothoracic Surgery Risk Stratification System. Category 1 = least complex cases. Category 5 = most complex cases. of rotational angiography, we continue to develop and utilize innovative techniques to optimize patient outcomes and minimize radiation exposure to provide the safest care possible. Hybrid Program Hybrid interventions combine surgical and transcatheter techniques to optimize outcomes. Surgeons work in tandem with our cardiac interventionalists to perform complex procedures less invasively than with traditional surgical techniques and on smaller patients than with catheterization alone. We have developed extensive experience in performing hybrid Stage 1 procedures in high-risk single ventricle patients, as well as other hybrid procedures including pulmonary artery interventions. Valve Implants Our team has performed more than 100 Melody® transcatheter valve implants, including in the pulmonary, tricuspid, mitral and branch pulmonary artery positions, and more than 20 SAPIEN™ transcatheter pulmonary valve implants, including in the native right ventricular outflow tract. We are one of seven centers participating in the COMPASSION trial (COngenital Multicenter trial of Pulmonic vAlve regurgitation Studying the SAPIEN interventIONal transcatheter heart valve) and one of 10 centers in the Melody® Post-Approval Study. Electrophysiology The electrophysiology program at C.S. Mott Children’s Hospital is the Midwest’s largest program, performing diagnostic testing and treatments for heart rhythm abnormalities. Local, regional and international patients seek the care of this group of experts. Heart Rhythm Devices Our team has extensive experience with implantation of pacemakers, conventional defibrillators, and implantable rhythm monitors, as well as with new technologies such as the subcutaneous implanted defibrillator (S-ICD), which offers a less invasive option for patients at a risk of life-threatening rhythm problems. Catheter Ablation All ablation procedures at the C.S. Mott Children’s Hospital are performed with 3-dimensional mapping systems and minimal X-ray, achieving lower patient radiation exposure than nationally published rates. Radiofrequency and cryoablation are both available. Arrhythmia Clinic Our outpatient Arrhythmia Clinic at C.S. Mott Children’s Hospital provides specialized care by pediatric electrophysiologists and nurse practitioners across the spectrum of rhythm disorders. We also provide heart rhythm care, pacemaker, and defibrillator outreach clinics in Lansing, Marquette, Traverse City, and Petoskey, MI, and Toledo, OH. Research and Quality Improvement We participate in benchmarking and quality activities through the MAP-IT Registry of the American College of Cardiology. Our electrophysiologists use computerized mapping technologies to minimize the use of x-ray, and the majority of ablation procedures are performed with less than one minute of x-ray time, resulting in a very low radiation exposure for our patients. Additional research areas include implanted defibrillator complications, supraventricular tachycardia treatment, new energy sources for pacemakers, and safe physical activities for patients with Long QT syndrome. Outpatient monitoring, exercise testing, and other non-invasive tests are coordinated through our electrocardiography laboratory, and can be performed on the same day as clinic appointments. Our dedicated pediatric cardiac diagnostic services provide high-quality non-invasive imaging by specially-trained sonographers and physicians with advanced training in pediatric cardiac imaging and functional assessment. We utilize advanced imaging to diagnose the most complex congenital anomalies and to facilitate and plan interventional and surgical care. Procedures are coordinated whenever possible to allow for convenient, sameday testing. We offer state-of-the-art techniques, including 3-D echocardiography, intracardiac ultrasound, and functional assessments. All tests are interpreted by dedicated pediatric cardiologists with specialized training in non-invasive imaging. Research and Quality Improvement Our faculty are national leaders in advancing the understanding of echo imaging of the child’s heart. The lab is involved in research studies establishing normal values for pediatric echocardiography, and investigating ideal approaches to cardiovascular management and imaging of children with single ventricle defects, rheumatic heart disease, and sickle cell disease. Two of our faculty currently serve on the Steering Committee of the Pediatric Council of the American Society of Echocardiography, including one as chair-elect. 2015 TOTAL ECHOCARDIOGRAPHY VOLUME provide echocardiography services at 12 locations throughout the state. In addition, through our cardiology telemedicine program, U-M pediatric cardiologists are available to provide remote echo interpretation and cardiovascular consultation as needed for referring providers located outside the Ann Arbor area. Cardiovascular MRI for pediatric and congenital heart disease, including adult congenital patients, is performed at C.S. Mott Children’s Hospital on state-of-the-art scanners. All studies are interpreted by dedicated pediatric cardiologists with advanced training in non-invasive imaging. MRI studies are often coordinated ahead of time with clinic visits for same day service. We work closely with the pediatric cardiac anesthesia service to care for patients who require sedation or anesthesia for their study. Fetal Heart Program In collaboration with the U-M Fetal Diagnosis and Treatment Center, our fetal heart specialists provide the full spectrum of fetal diagnostic, interventional and delivery planning services. Fetal Intervention Services Our specialized fetal intervention services include catheterbased fetal cardiac interventions for babies who are candidates, including those with critical aortic stenosis or hypoplastic left heart syndrome complicated by a restrictive atrial defect. Over the years, we have become established as a high-acuity fetal program offering major fetal interventions that are not widely available. Michigan ranks as one of the top fetal heart programs worldwide in volume of fetal cardiac interventions, having performed interventions since 2008. Research and Quality Improvement The Fetal Heart Program works collaboratively with colleagues across the country to optimize care for our tiniest patients and their families through efforts such as the National Pediatric Cardiology Quality Improvement Collaborative, the International Fetal Cardiac Intervention Registry, and the Fetal Heart Society. Recent research projects led by our investigators have included a randomized trial investigating a strategy to reduce maternal stress in mothers of infants with single ventricle heart disease. Outreach Our fetal cardiologists currently see patients in Ann Arbor, Northville, Lansing, and Marquette. We work closely with referring physicians to co-manage the pregnancy and to continue routine care close to home as much as possible. Heart Failure and Transplant Heart Transplant Program Our program has performed more than 200 pediatric heart transplants since the transplant program began in 1984, consistently reporting low organ rejection rates and high patient survival rates that rank among the world’s best. Our dedicated, multidisciplinary team of pediatric cardiac transplant surgeons, heart failure and transplant cardiologists, nurses, pharmacists, nutritionists and social workers provides coordinated and comprehensive evaluation, treatment and follow-up management, including a full spectrum of support services to children and their families. The full multidisciplinary team meets and reviews pre- and post-transplant patients weekly to assure the best and most comprehensive care is provided to each individual patient. We participate in multiple organ transplant listings and have experience performing combination transplants such as heart/kidney or heart/liver. As a part of treatment for advanced heart failure, our center employs a comprehensive ventricular assist device program with experience in multiple devices appropriate for pediatric patients. We also offer comprehensive pulmonary hypertension and cardio-oncology services. Research and Quality Improvement Our innovative research endeavors give patients access to the newest treatments available. Our heart failure/transplant team is actively involved in multiple projects, including assessment of modifiable transplant risk factors, quality of life in pediatric heart failure patients, single ventricle transplant risk factors and outcomes, and novel therapies pre- and post-transplant. Each project is ultimately aimed to improve care in this complex patient population. Heart Failure Services Our team provides comprehensive care for children with advanced heart failure. We have extensive experience evaluating and treating children with heart failure resulting from cardiomyopathy and palliated congenital heart disease, including patients who have undergone the Fontan operation. Adult Congenital Heart Program Our team provides expert care to adult patients with congenital heart disease throughout the state and region, with extensive experience in adult congenital cardiac imaging, high-risk obstetrics, pulmonary hypertension, cardiomyopathy, and heart failure management. Percutaneous interventions, among other treatments, offer todayâ&#x20AC;&#x2122;s patients more options for optimal outcomes and quality of life. To date, we have performed more than 100 percutaneous valve replacements, avoiding the need for repeat open-heart surgery. Our adult congenital specialists are board-certified in Adult Congenital Heart Disease, Pediatrics, and Internal Medicine. Research and Quality Improvement Through several ongoing initiatives we are working to establish best practices and advance the standard of care for adults with congenital heart disease. Current projects include the study of longterm outcomes in adults with tetralogy of Fallot and congenitally corrected transposition of the great arteries, the impact of healthcare reform on adults with congenital heart disease, and efforts geared toward understanding and optimizing the transition process. Outreach Adult congenital providers see patients in Ann Arbor, Marquette, Lansing, Kalamazoo, Traverse City, and Petoskey. Caring for Patients and Families Patient and Family Centered Care Program (PFCC) Patients and families are integral members of our team. We are committed to partnering with families on every aspect of care, from ensuring family-centered bedside rounding, to including patient or parent advisors as committee members for every aspect of our work, including strategic planning, process improvement initiatives, and research activities. Our PFCC program and advisors promote these principles throughout the continuum of care, and provide training to patient and parent volunteers to facilitate participation in support groups, educational and advocacy activities, research, and other initiatives. Support Services C.S. Mott Children’s hospital offers comprehensive support services to patients and families throughout their hospital stay. These include an on-site Ronald McDonald house, a hospital school program, spiritual care, a child and family life program, activity centers including an indoor playground, and animal therapy, among many others. Our goal is to coordinate with referring physicians to keep care close to the patient’s home whenever possible. Our cardiologists also see patients at a number of convenient locations throughout the region. In addition, we offer telemedicine capabilities to connect referring physicians and patients with team members at C.S. Mott Children’s Hospital in real time, without the expense and stress of traveling far from home. When urgent transport to C.S. Mott Children’s Hospital is necessary, our Survival Flight helicopters and jets, along with expert staff, can accommodate all types of pediatric heart patients, including high-complexity transports, and patients on ECMO or ventricular assist devices. Research and Innovation One of the primary goals of the U-M C.S. 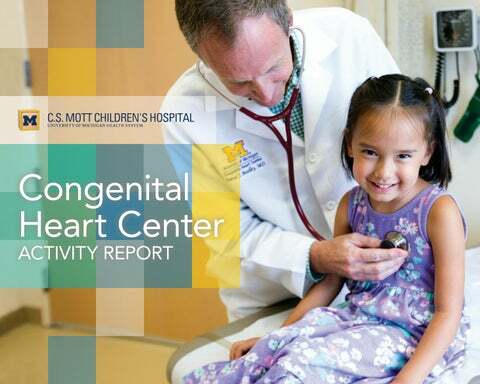 Mott Children’s Hospital Congenital Heart Center is to support research and innovation to drive improvements in quality of care and outcomes for children with heart disease. the PHN Integrated CARdiac Data and Outcomes (iCARD) Collaborative. Quality and Efficiency of Care Delivery Our investigators lead national efforts to better understand and measure quality of pediatric cardiac care. Our research has suggested that high-quality care is also likely to be associated with reduced health care costs. We are collaborating with national partners to develop performance metrics that incorporate quality measures beyond mortality alone, and to provide integrated feedback regarding both quality of care and healthcare costs to U.S. childrenâ&#x20AC;&#x2122;s hospitals. prolong preservation, and allow for the potential to perform functional assessment and immunologic manipulation before proceeding with transplantation. 3-D Printed Tracheal Splint As reported in the New England Journal of Medicine, Congenital Heart Center investigators have collaborated with Pediatric Otolaryngology and U-M Biomedical Engineering to implant the first bioresorbable external airway splints created using 3-D printing technology. The novel splints are tailor-made for the patient and constructed of bioresorbable material that suspends the airway while also allowing for growth. To date, six patients with life-threatening tracheobronchomalacia have benefited from this new device and are now thriving. In 2017, investigators will initiate an FDA trial to begin the process of making the splint more widely available. 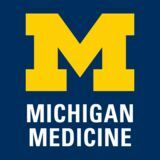 Basic and Translational Research University of Michigan investigators conduct basic and translational investigation geared toward supporting breakthroughs in congenital heart care. Personalized Medicine Our investigators conduct research to understand the genetic determinants of congenital heart disease, and to investigate the influence of genetic variations on clinical outcomes including responses to various treatments. The overall goal of this research is to develop a personalized treatment plan for each patient based on the genetic cause of their heart condition and other genetic traits. Regenerative Medicine Our team is also leading studies exploring new treatments for children with heart failure through stem cells and tissue engineering. We are evaluating the use of stem cells to help rebuild muscle and blood vessels in failing hearts, including identifying and purifying stem cell tissue with especially potent regenerative properties, and establishing optimal techniques for delivery of the stem cell tissue to optimize the regeneration of failing hearts. We offer world-class fellowship training programs in pediatric cardiology and congenital heart surgery. Our three-year pediatric cardiology fellowship program provides comprehensive pediatric cardiovascular clinical and research training and typically accepts six fellows annually. In addition, there are advanced fourth year fellowships available across subspecialty areas. Our congenital heart surgery fellowship trains two fellows each year. Established in 1995, this annual conference provides support, education, and social interaction for ICD recipients of all ages and their families. Held annually, this interactive conference provides an update for pediatric practitioners across the region on general and subspecialty pediatric topics, including the care of children with congenital heart disease, and aims to foster better integration of acute and chronic pediatric care. Transparency Summit In collaboration with the Pediatric Congenital Heart Association, we will be hosting a Transparency Summit in 2017 geared toward optimizing transparent reporting of congenital heart center outcomes. Joint Conference on Advances in Pediatric Cardiovascular Disease Management This annual conference brings physicians, nurses, and trainees from across the country together to learn about cuttingedge technologies and the latest advances in pediatric cardiovascular care. The next conference will be held in September 2017 in Ann Arbor, MI, sponsored by C.S. Mott Children’s Hospital in collaboration with the Children’s Hospital Los Angeles and Children’s Healthcare of Atlanta. 1540 E. Hospital Drive, 11th Floor | Ann Arbor, MI 48109 To make a referral or speak with one of our specialists, contact M-LINE 24 hours a day, 7 days a week.